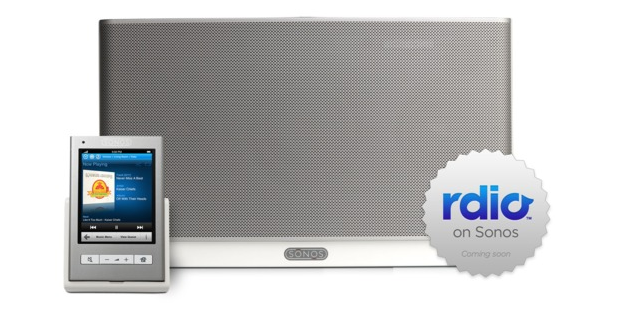 Pretty sure 99.9% of you won’t care one bit, but this fills me with joy: Rdio, the music service I was most happy to have discovered in 2010, will soon be available on Sonos, the awesome wireless sound system I was most happy to have discovered in 2010. Scheduled for release ‘later in Q1 2011′, Rdio Unlimited subscibers (that’s me!) in the United States and Canada will be able to listen to the social music service on Sonos’ phenomenal Multi-Room Music System. Sonos already had partnerships in place to do the same for Spotify, Last.fm, Napster, Pandora, Rhapsody and SIRIUS users (it also lets you access the single best-kept secret in online music land, Wolfgang’s Vault). But as a proud Rdio fan, and I was left out in the cold. Sure, I got Sonos’ wireless docking station so I could actually use the Rdio iPhone app to stream music to the system, but it wasn’t an ideal solution (considering the phone also receives calls, text messages, push notifications and whatnot whilst streaming). Rdio and Sonos, you’ve made my day. Apologies, 99.9% of you who don’t care.